They are spread out across the country, and there's even one in Canada. My sister (obviously my maid of honor), T.J.'s sister, my cousin, and six more girls who are, or were at one point, roommates of mine. All these girls are so special to me. They're the ones who no matter how far apart we are or how long it's been since we've seen each other in person, I know they will always be my best friends. I wanted to find a special way to ask each of them to stand up with me on my wedding day and to let them know how important they are to me. I had seen such a cute project over on the blog Rinse. Repeat. a couple years ago and it's been pinned on my secret Pinterest board ever since. I couldn't wait to pull it together for my own wedding. I headed to the craft store and picked up 9 white boxes, green acrylic paint, gold paint pens and cream card stock. I also got cute mini brown envelopes big enough for a gift card, and brown and white baker's twine. The idea is that all these colors will eventually coordinate with our wedding colors so this will also be a little sneak peak into the feel of our celebration. To start, I wrote each girl's name in gold calligraphy on the top of the boxes. Inside the lid I wrote "be my bridesmaid?" then drew a decorative bracket and painted around the border in the green paint. Inside each box I included 4 cards with information about the wedding and their role, the names and phone numbers for the other girls in the bridal party, and all about their dresses. (Plus an extra special letter for my sister asking her to be my maid of honor.) I bundled the cards together and tied it in a bow with the bakers twine. Since I have already picked out the dresses I want my bridesmaids to wear, I also reached out to J.Crew for 9 fabric swatches in my chosen color to include in each box. My plan is for each girl to wear a long dress of the same fabric and color but to have a variety of styles. There are four different dresses at J.Crew that I am happy for the girls to choose between. I printed out a card with a picture of each dress and the name of the style below. That way they can pick the one that will suit them best. 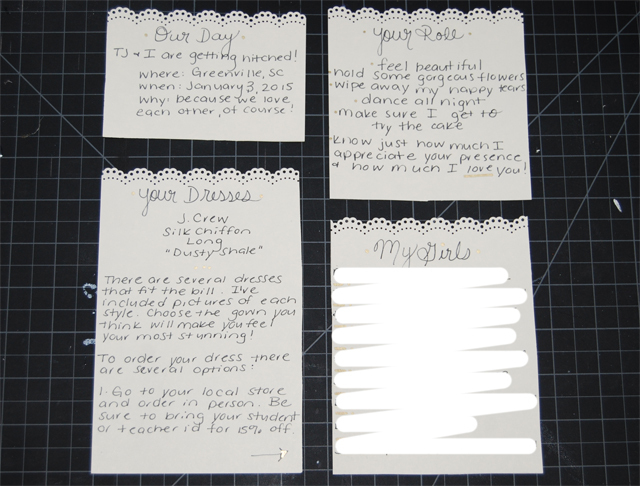 I also gave them information on how to order their dress. And for funsies I included wintergreen tic tacs and a j.crew gift card in little brown envelopes that I jazzed up with a gold heart. I sealed each box with gold washi tape and mailed them all out in padded envelopes. They all said YES! One of my favorite things is to give and receive real mail so even though this maybe was a little over the top, I hope it brightened each of their days and got them excited for our big day in January! These are adorable! I love hearing about your wedding planning! Where did you learn calligraphy - did you take a class? Very creative and so special. There are so many wonderful ideas on Pinterest, and you took this one over the top. Awesome! such a cute idea. I love the idea of the same color bridesmaid dresses but different styles. So Cute!!!! Who wouldn't say yes to such a sweet invitation? !